For these fudgy treats, you spread the frosting on the cookie before baking. Just be sure to use real chocolate (not imitation) because a not-so-real product won't bake properly. 1. In a mixing bowl combine flour and cocoa; set aside. In a large mixing bowl beat the butter or margarine with an electric mixer on medium to high speed about 30 seconds or until softened. Add sugar, salt, baking powder, and baking soda. Beat until well combined. Add egg and vanilla. Beat well. Gradually beat in the flour mixture. 2. Shape dough into 1-inch balls; place on ungreased baking sheet. Press down center of each ball with thumb. Drain maraschino cherries, reserving juice. Place a cherry in the center of each cookie. In a small saucepan combine the chocolate pieces and sweetened condensed milk; heat until chocolate is melted. Stir in 4 teaspoons of the reserved cherry juice. 4. Bake in 350 degree F oven about 10 minutes or until done. Remove to wire rack; cool. Cover and store at room temperature up to 2 days. These are my favorite cookies!! They only hold for a maximum of 5 days though, and then they get hard, but they are so delicious, and just the right size! These cookies are great! I shared them with my family and work friends, everybody loved them and they keep asking me when im going to make them again. I tried these just today. My sister made them. 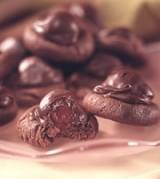 I dont LOVE chocolate covered cherries...but theses cookies....are THE BOMB! I'm getting your recipe now actually. DELICIOUS! !